It probably won't come as a surprise to you, reader, that sometimes Clinic can get very, very, very busy. This happened last week, the week of March 9th, so we didn't get a chance to get a Team of the Week. Lucky for us, though, Joe Choi an M4 on Urgent Care Team 5 was a ROCKSTAR another day in Clinic when he was spontaneously asked to jump into a meeting with a patient he wasn't even scheduled for. 1) If you were a disney princess who would you be and why? Joe Choi (M4): "I would definitely be Belle so I could be played by Emma Watson one day." 2) What's your favorite thing about Jess Bernstein (Joe's M3 team member)? 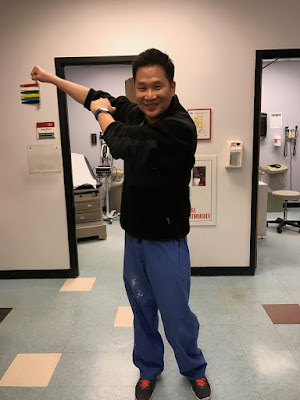 Joe Choi (M4): "She’s more of an ortho bro than I am." 3) What were your thoughts when you decided to show up to clinic in inappropriate attire? Joe Choi (M4): "I thought 'Eh, senioritis.'"